Put options give the buyer the right, but not the obligation, to sell an underlying asset at the strike price until market close on the 3rd Friday of the expiration month. Just like call options, put options come in various strike prices depending on the current market price of the underlying instrument with a variety of expiration dates. Expiration dates can vary from one month out to more than a year (leaps options). However, unlike call options, you might consider going long a put option if you expect market prices to fall (bearish). In contrast, if you are bullish (expect the market to rise), you might consider selling a put option. If you choose to buy or go long put options, you are purchasing the right to sell the underlying instruments at whatever strike prices you choose until the expiration date. The premium of the long put options will show up as a debit in your trading account. The cost of the premium is the maximum loss you risk by purchasing put options. The maximum profit is limited to the downside as the underlying stocks fall to zero. A profit can be made in one of two ways if the underlying market declines. By exercising put options, you are short 100 shares of the underlying stocks. If and when the underlying stocks fall below the put strike prices, you can exercise the puts to short the shares at a higher price and then buy the underlying stocks at a cheaper price to cover the short and exit the trade (strike price – current price = profit). The second technique for profiting on a put comes from offsetting it. If the price of the underlying stocks fall, the corresponding put premium increases and can then be sold at a profit. If you go long put options and the underlying security (index or stocks) increases in price, the value of the puts will fall. Then you can either sell the put at a loss or let it expire worthless. If you choose to sell or go short a put option, you are selling the right to sell the underlying stock at a particular strike price to an option holder. The premium of the short put will show up as a credit in your trading account. In most cases, you are anticipating that the short put option will simply expire worthless on the expiration date so that you can keep the premium received. The premium amount is the maximum profit you can receive by selling a put option. If the underlying stock falls below the put strike price, the put will most likely be assigned to an option holder who may choose to exercise the option. The option seller then has an obligation to buy 100 shares (per option) of the underlying stock at the put strike price from the option holder. You will then be long 100 shares of the underlying stock and your loss depends on how low the price of the underlying stock falls as you try to sell the shares to exit the position. Experienced traders who choose to go short put options do so in a stable or bull market because the put will not be exercised unless the market falls. 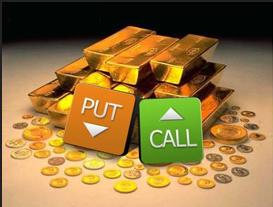 Put options give you the right to sell something at a specific price for a fixed amount of time. A put option is in-the-money (itm) when the strike price is higher than the market price of the underlying asset. A put option is at-the-money (atm) when the price of the underlying is equal (or close) to its strike price. A put option is out-of-the-money (otm) when the price of the underlying security is greater than the strike price. Example: Jane opens a small travel business that specializes in island vacations. The manager of a a local business agrees to purchase 100 trips to Hawaii in January for $300 round-trip as perks for his employees. Jane’s computed total cost of each trip is $200-a $100 profit on each trip which locks in a guaranteed profit of $10,000 for her initial period of operation. In effect, the guaranteed order is a put option. Scenario 1: As luck would have it, just as November rolls around, a competitor offers the same trip for only $250. If Jane didn’t have a put option agreement, she would have to drop her price to meet the competition’s price, and thereby lose a significant amount of profit. Luckily, she exercises her right to sell the trips to Hawaii for $300 each and enjoys a healthy profit in the new year. Jane’s put option was in-the-money in comparison to the price of her competitor. Scenario 2: Jane gets a call from another client who needs to set up 100 trips in January to fulfill obligations to his management team and is willing to pay up to $400 per trip. Since Jane is under no obligation to sell the trips to her first customer, she agrees to sell them for the higher market price and makes a total profit of $20,000 on the deal. 1. Put options give traders the right, but not the obligation, to sell the underlying stock at the strike price until market close on the 3rd Friday of the expiration month. A put option is in-the-money (itm) if its strike price is above the current price of the underlying stock. A put option is out-of-the-money (otm) if its strike price is below the current price of the underlying stock. A put option is at-the-money (atm) if its strike price is the same as (or close to) the current price of the underlying stock. 2. Buying Puts – If the options trader is bearish — believes the underlying stock or index will fall in price — the trader can buy (go long) puts. When the put is purchased, it is called an opening transaction. Now, the buyer has rights. A put buyer has the right, but not the obligation, to sell the underlying stock at the strike price of the option until the expiration date. Furthermore, if a trader buys a put option, the risk of the trade equals the money paid for the option, or the debit. The profit is equal to the fall in the price of the underlying asset. The profit will result if the underlying security moves lower. The profit is limited because the underlying asset will not fall below zero. Finally, to offset a long put, the trader will sell a put with the same terms (strike price and expiration) to “close” out the position. On the other hand, if the trader exercises a long put, then he or she is selling, or short, the underlying stock or index at the strike price of the put option. 3. Selling Puts – If the options trader is bullish — believes the market will rise — the trader can sell (go short) puts. Sellers have obligations. A put seller has the obligation to buy 100 shares (per option) of the underlying stock at the put strike price. In other words, the option seller must be ready to have the stock “put” to him or her. The put seller’s risk is the drop in the stock price, which is limited to the stock falling to zero. The profit equals the credit received from the sale of the put. Put sellers often prefer options with little time left until expiration because they want a put to expire worthless. In that way, the seller keeps the entire premium. A short put is offset by purchasing a put with the same strike price and expiration to close out the position.